Two rats — one in North Carolina, the other in Brazil — worked together on a task by communicating telepathically, thanks to implants in their brain. Electrical signals from a "leader" rat’s brain were collected, encoded and then zapped into the "follower" rat’s cortex in the form of an electrical signal. The follower rat then pressed one of two levers based on a light visible only to the leader rat. The Duke University experiment is the first time two animals have collaborated through such an artificial link, and shows that the mammal brain can be trained to act on electrical signals from another animal. Miguel Nicolelis, the Duke neuroscientist who led the team from Duke and the International Institute for Neuroscience of Natal in Brazil, believes that information transfer could extend to other senses, too. “You could think about taste, vision — I don’t see any problem doing this,” he told NBC News. He says his wired rat duo show that the linking of mammalian brains is possible, but why stop at just two? "I could see a swarm of rats be informed by one rat," he says, "Most of them driving to the source based on information from another individual," a concept he calls a "Brain Net." Nicolelis and crew published their findings in Scientific Reports Thursday. “I still think it's wild that he made it possible,” Ron Frostig, a neurobiologist at the University of Irvine who was not involved with the experiments told NBC News. This experiment is in many ways extension of brain-machine tech that has been on slow boil at the Nicolelis lab for over a decade. Earlier in February, the Nicolelis lab showed that rats could be trained to act on infrared cues. Rats, like people, can’t naturally sense infrared light — an infrared sensor activated a implant in the rats' brains. Eventually they learned to follow that signal, approached the right hole, and received a reward. In the latest "mind-reading" experiment, both lead and follow rats went through a series of training phases. The leader rat was trained to use a lit light bulb to choose which of two levers to press. The second rat was trained to receive and act on gentle zaps of electrical stimulation in its brain. 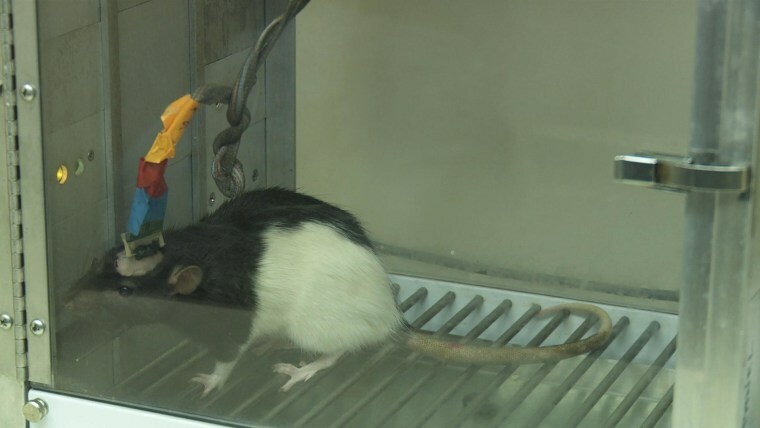 Once the two were wired up together, the second rat received signals from the leader rat's brain indicating which lever to choose. When the follower pressed the right lever, it was rewarded with water, and the leader was rewarded as well. The leader rat eventually figured out that the clearer he was with his “instructions,” the better his chances of getting a double reward. Frostig pointed out that this training was crucial to the success of this series of demonstrations. While the link between the rats seems telepathic to casual observer, the rats don't necessarily know the other exists, Nicolelis explains. The follower rat feels a tingle in its brain and discovers that interpreting it one way rather than another leads to a reward. Marshall Shuler — a neuroscientist at Johns Hopkins University who was Nicolelis’ student in the late 1990s — describes it as a "special and powerful case of conditioning." "What's unique about this is that one animal is getting information that has nothing to do with it environment," he told NBC News. The researchers are years away from testing this kind of electronic telepathy in people. Still, based on what is known about how people respond to brain stimulation and implants, Shuler says we might be better than the rats at interpreting intracranial cues. "I would think that humans would be able to exploit this information even more efficiently," Shuler says. Nicolelis says they are “perfecting the experiment” in monkeys, training them to collaborate in a virtual game. In the past, the Nicolelis lab has trained brain-implanted monkeys to control a cursor on a screen using only their thoughts. In another computer game, a monkey pawed at virtual discs of different simulated textures, and was trained to pick one texture over the other, demonstrating one way information about touch could be fed back into the brain. Take the field of prosthetics, a zone the Nicolelis lab is at home in. Ultimately, Shuler says, the goal is to get prosthetics to send touch data back to the user. A number of labs have shown that the brain or residual nerves can move a prosthetic limb. What many of those smart body parts lack is a way of relaying sophisticated feedback back to the brain. The Nicolelis lab may well provide the answer.